I woke up on Saturday morning to snow. And I thought, snow + weekends = chili. Who am I kidding? I can eat Two-bean Turkey Chili almost every night of the week. Especially during these cold winter months. 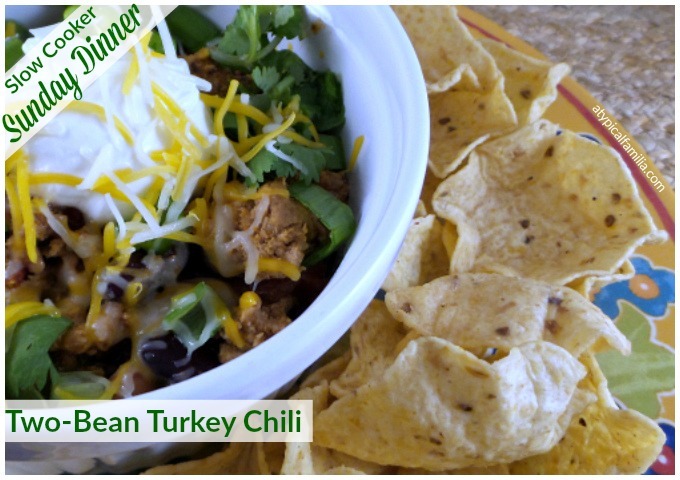 Turkey chili is hearty, healthy, family friendly and perfect for game-day. It’s great for leftovers and something easy to freeze. Chili with all the fixings is the ultimate cold weather comfort food. It’s a versatile meal that you can cater to meet your individual taste. The kind of meal that sticks to your bones and makes you feel good. 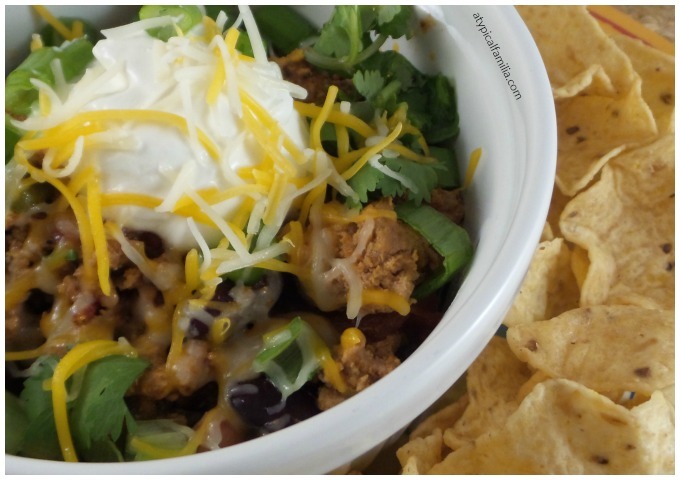 And a turkey chili can make you feel a little less guilty about making you feel so good. Chili is one of the easiest things to make especially in a slow cooker. You can literally throw in whatever you have on hand and walk away. Don’t think too about it. Use what you have, put in what you like. Take out what you don’t. Heat a large non-stick skillet over medium-high heat and add olive oil. Transfer turkey to slow cooker. Dump in all those other ingredients into the slow cooker and stir. Cook in slow cooker on HIGH for 4 hours or LOW for 8 hours. Serve in bowls with a side of tortilla chips (or pita bread) and garnish with optional chili toppings. Optional for serving: cilantro, scallions, shredded cheddar, sour cream. It's your world -- add as much or as little as you want!